Will Stainless Steel hold up longer then mild steel? Yes it will hold up longer then mild steel. You can expect a typical well-maintained mild steel unit to last anywhere from 7-12 years on average before needing replacement. A well-maintained stainless steel unit will last 20 or more years. 409 Stainless Steel is specifically made for high temperature situations, has better heat transfer and warps less than 304 Stainless Steel. 304 Stainless Steel tends to corrode slowly, but has poorer heat transfer. Why don’t you offer a dual-fuel option on your furnaces? While this option may look appealing at first glance, it really doesn’t offer anything most customers don’t already have in the form of an existing indoor heat source. When installing a furnace you can set the existing heat source as the back up by simply using another thermostat. Then if there is a power outage or a pump failure, there is still heat whereas the dual-fuel furnace would give you no back up. What is the difference between a forced air and natural draft furnace? The difference is how the air to stoke the fire is brought in to the firebox. Natural draft furnaces open a damper that allows air to draw in to the firebox directly from outside. Forced air furnaces use blowers to blow air directly in to the firebox with more control than natural draft furnaces while also having the option of using variable speeds to better control your firebox burn rate. They also allow the furnace to burn hotter. What is the difference between a pressurized and non-pressurized furnace? Pressurized furnaces are sealed systems that operate on higher temperatures and use steam power to heat. They can generally put out more BTU’s but are made only for industrial purposes. While they do put out more BTU’s, they are more dangerous and cost more money to purchase and maintain because you need a certified boiler technician to install and repair the furnace. Pressurized furnaces are usually only available in industrial size models. How do the rocker grates work? What makes them worth the money? 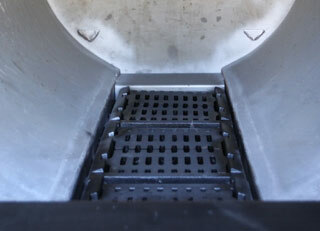 Rocker grates allow you to burn wood, coal and/or cob corn. They also make it extremely easy to keep the firebox clean and well-maintained by having the ashes fall into the ash pan. This feature is probably the most popular feature on the market right now. Many manufacturers are trying to copy the idea with little success. Why is it that this furnace can burn multiple fuels (wood, coal, corn) and others can’t? What allows our MF-Series to burn multiple fuels is the air being blown under the rocker grates and below the fuel being burned. Our MF-Series works particularly well with lump coal and cob corn. What makes the HeatMasterss a better buy than other furnaces? You get the most square footage, the most features and best quality for the price. Our stainless steel furnaces are priced similarly to mild steel furnaces and offer more of the features you want because we avoid distributors and sell dealer-direct. Bottom Line – You get more value for your dollar!